Fly from Corona (KAJO) to Victorville (KVCV) using the Obstacle Departure Procedure. Shoot the VOR/DME RWY 17 approach to minimums, go missed and then once established on the missed, cancel IFR and return under VFR for a full stop landing at KVCV. Note: this rating does not include an ATC transript. On departure, fly the published Obstacle Departure Procedure (ODP) to include the hold at PDZ, even if the aircraft is high enough to not warrant the holding procedure. Pilots should inform ATC of their intention to fly the ODP and the hold once airborne so that ATC will anticipate the need for the hold. Request the VOR/DME RWY 17 approach into KVCV, flying the arc from APLES intersection. Fly the approach to minimums, execute the missed approach. Note: X-Plane’s nav database uses 109.40 as the VCV VOR frequency whereas the real world frequency is 109.05. During the missed approach, once clear of the Victorville Class D airspace, cancel IFR and return to Victorville VFR with a full stop landing. Pilots who are not yet familiar with the procedures are encouraged to research the topic through other references, especially the topic of flying DME arcs. The required/recommended material list has been left empty, as it’s expected that pilots are able to retrieve Airport Facility Diagrams and instrument approach plates at this stage of the program. The ODP is available in the Special Takeoff Minimums publication, available through the KAJO airport page on skyvector and other online sources. The ODP is included inline here as a discussion point, but pilots should be become equally comfortable retrieving them through public sources as they should be consulted as part of standard IFR flight planning in cases where ATC does not provide a vector or SID to the first fix. ODP’s provide obstacle and terrain separation for departures out of a specific airport. They exist in cases where an airport has been surveyed for obstacles (ie, it has one or more instrument approaches) and has been found to have obstacles or terrain that would be a factor if an airplane were to depart in a random direction at a minimally acceptable climb gradient. See the workshop in the Related Materials for more details as to when ODPs are developed for an airport. ODPs may be flown any time ATC has not assigned a Standard Instrument Departure (SID) or a radar vector, even when they are not included in the clearance. In some rare cases, they may also be assigned by ATC for separation and traffic flows. 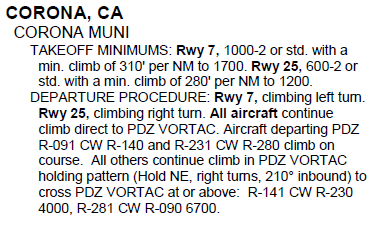 Reviewing the ODP, it can be summarized as follows: Turn towards PDZ VORTAC (left turn off rwy 7 or a right turn from rwy 25). If you’ll be departing PDZ on a course of 091-140, or 231-280, you can continue on course after PDZ. Otherwise, HOLD NE at PDZ on the 030 radial, right turns) to cross PDZ at or above 4000 (courses 141-230) or 6700 (281-090). Astute readers might notice that the PDZ R-030 is actually V8. With the I-11 under your belt, you’re free to take part in the Sky High Charters program!